The Acolytes at St. Michael’s assist the congregation by performing tasks during the worship service, including processing with cross and candles, and assisting the clergy in setting the table for the Eucharist. 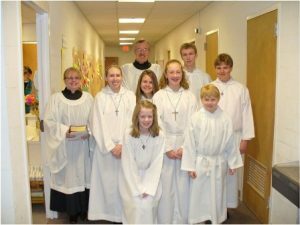 There are currently twenty nine boys and girls ranging in age from 5th grade to high school seniors in the Acolyte program. The program involves training and advance scheduling so that there can be an acolyte team assigned each Sunday, as well as for special holy days such as Christmas and Easter. Usher greet the parishioners as they arrive for the 9:45 AM Sunday morning service and provide them with a service bulletin. If required, the usher assist guests in finding seats. The ushers collect the weekly offering and release the congregation to proceed to the altar rail to receive Holy Communion. There are various other ‘behind the scenes’ duties that the ushers perform before, during and after a typical Sunday morning service. Ushers are assigned for all 9:45 AM services and for some special services throughout the year. We currently have 38 men and women serving as ushers at St. Michael’s. Basic responsibilities for Altar Guild members include preparing the altar for The Holy Eucharist and Morning Prayer at weekend services, weddings, funerals, memorials, baptisms, Memorial Garden services, and any special services which the Rectors request. Community outreach includes a monthly communion service at Sunset House on Indian Road. 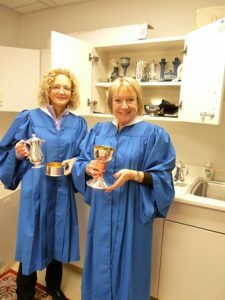 We keep communion vessels, linens, frontals (on altar), and falls (on pulpit and lectern) clean and in good condition. Altar Guild members also decorate the church for Christmas and Easter, organize the Maundy Thursday Service and serve the meal. They keep supplies ordered and stored, and make sure candles are filled for services. Teenagers and adults are welcome to become lectors, who read the Scripture lessons during the services; and Eucharistic ministers, who administer the chalice during celebrations of the Holy Eucharist. In addition, lay people lead the prayers during services of Morning Prayer. Initial training is provided, with periodic group meetings with the coordinator and clergy to keep everything going smoothly. Lay people also provide an invaluable ministry by taking the Sacrament to homebound parishioners. Special training is provided for this ministry.